The Real Estate Business and the Internet have been friends at times and not so much at others. For many the Internet has been reduced to the simplicity of generating Buyers’ Leads and that business plan has been faltering for many; they spend more and more resources on Pay-per-Clicks and get fewer and fewer actual closings for said resources – in other words Buyers’ Leads are getting more and more expensive. The fundamental building blocks of Real Estate Brokerages has not changed; it is still, and will continue to be, about generating Listings, and 2013 is not going to be a year of survival, rather it ought to be the year of Success and Prosperity. Brokers must design a clear plan of action driven by Prospecting; and that starts by having Web Services that complement and enhance such Marketing Services – your website should reflect your values and marketing to Sellers via Social Media, Education Videos, Narrated Videos, Community Blogs, and individually enhanced listing services. 2013 is a year that you can design to give you exactly why you choose to put into it – why not grow it the right way by having a plan of action! At present the real state business is most popular and online work is increasing day by day.The work you will finish,you can get it this work via real state. Realty Edmonton offers variety of houses, condos and apartments in different styles and features. Oh, that is a good idea. 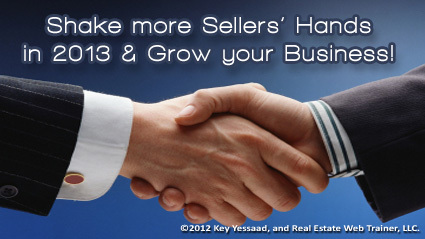 Maintain the role, they will make a good relationship in every Real Estate Home Seller. Thanks a lot.